At Crawley Cleaners we love a good party and Party Cleans are jobs we also love. So if you have a party planned whatever size, and do not want to do the after party clean or indeed a pre party clean, give us a call. Crawley Cleaners provide a professional After Party Clean to suit our clients specific needs. We provide all cleaning materials with no hidden costs for a weekend After Party Clean. Whichever type of celebration you are hosting you will be provided with a highly professional Party Clean. At Crawley Cleaners we understand the importance of restoring your home or hired premises to its original state as quickly as possible. As part of the after party clean, the premises hosting your party will have all party areas professionally cleaned to the high standards that Crawley Cleaners provide. Disposing of all available junk food / bottles, cans and other rubbish. Washing dirty plates, cups, glasses. Dust polish furniture, glass and mirrors. Deep clean bathroom and toilet areas. Vacuum all areas to remove dust and dirt. Crawley Cleaners also provide a Pre Party Clean getting your premises ready for hosting your party. Planning a party can be stressful and sometimes leaves you little time to give your premises a good clean. 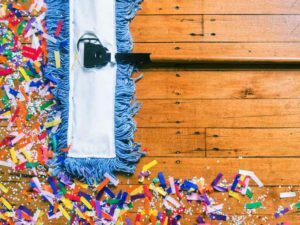 Why not count on Crawley Cleaners to have your premises party ready with a great Pre Party Clean. As we like to say at Crawley Cleaners, no job is too big no job is too small and get your party off to a clean start. For more information on After party Cleans and Pre Party Cleans, please call us at Crawley Cleaners on Landline : 01293 279599 or Mobile : 07846 646725 or use our contact form and leave a message.